Experienced in architecture, fashion and design, Julia Körner combines formulae from the natural landscape with technological advancements. Having previously featured in Aesthetica, Körner returns with a new collection. A: Much of your portfolio focuses on ready-to-wear fashion pieces. 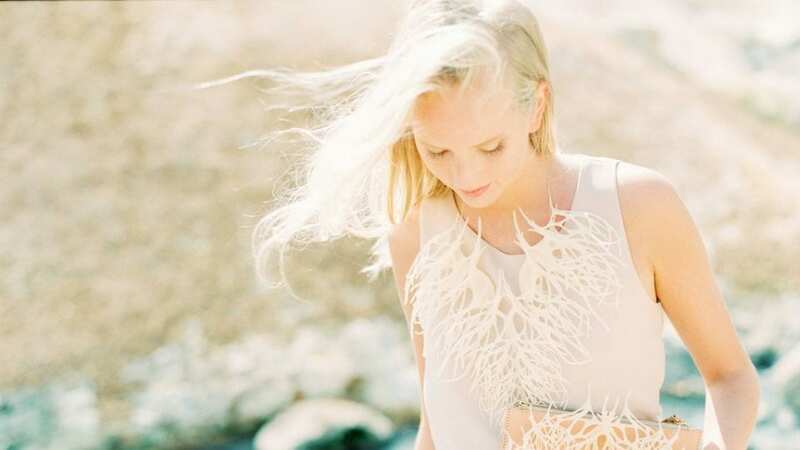 How does 3D printed clothing differ to conventional pieces in this respect? Can you discuss some advantages and challenges of using 3D printing in this type of medium? JK: With the Iceland collection I designed a series of 3D printed garments and accessories with a focus on wearability. I developed some of my previous research into natural formations and 3D printed material performance further and applied it to garments such as Jackets, Vests, Handbags, Necklaces and Skirts. 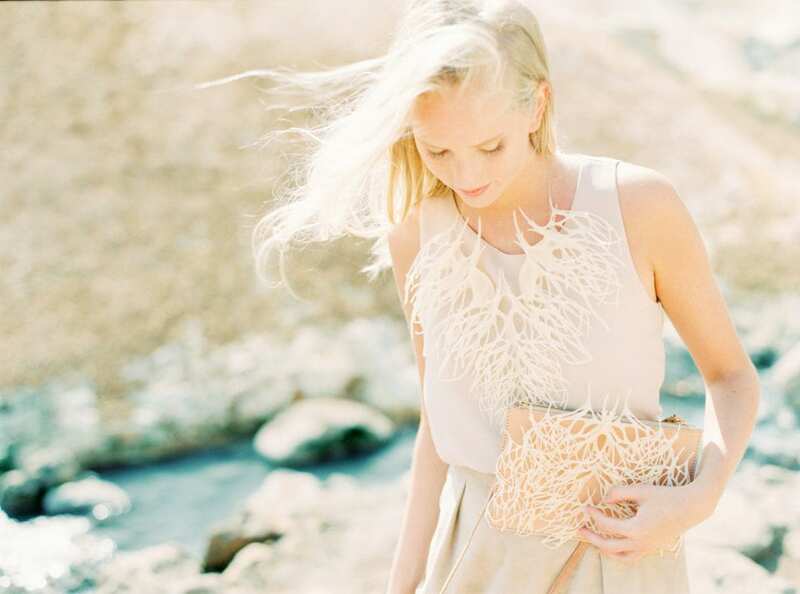 The 3D designs are inspired by patterns and morphologies found in nature such as Kelp and Sea Sponges, and I designed the three-dimensional pieces in the computer. The 3D printing technology allows to realise these designs with all their complexity, intricacy and beauty. With a focus on elevating the wearability of the garments I researched various different additive manufacturing technologies as well the combination with delicate textiles such as leather, silk and cotton. A: Iceland Collection combines fine leather craftsmanship with the automatic outcomes of 3D printing. Why did you choose to combine traditional and technological? JK: Many of the 3D printed garments I have digitally designed in the past are showpieces which were exhibited at Haute Couture Paris Fashion Shows and in Museums such as the Metropolitan Museum in New York and architecture exhibitions such as the Tallinn Architecture Biennale in Estonia or the FRAC Centre in Orlean, France. For the Iceland Collection I wanted to create pieces which are more accessible and wearable and therefore developed a series of clothes with the potential to be directly sold to customers who can wear them at special occasions. The process of digitally designing the pieces in the computer is a timely process and needs a lot of expertise. Once I digitally crafted the structures with visual programming and 3D modelling techniques, I 3D printed the pieces in my atelier and also sent some files for printing in Belgium and Netherlands. Thereafter I hand dyed and refined some of the 3D prints and sewed them onto the textiles. The combination of the digital craftsmanship and the hand stitching enhances the quality of the garment and embellishes the movement, flow and durability of the wearables and accessories. A: The look book for the collection is divided into three key themes: Kelp, Hymenium and Venus. What about these natural forms inspires you? Are you hoping to mimic found shapes or extend perceptions through 3D printing? How does your work exemplify these aims? JK: The different key themes inherit different aesthetics and material performances. Kelp is inspired by dried seaweed which I found on the beach in Malibu and 3D scanned and then developed 3D morphologies out of it. The intricate layering of the lace like pattern makes the structure appear very organic and it looks like they are grown naturally into their shape around the body. Hymenium is inspired by the underside of a Portobello Mushroom and the lamellas have a repetitive rhythm which appears as pleated fabric. The undulating gills allow for visual transparency effect and give glimpses on the underlying skin or fabrics. Finally, the Venus theme derives from the structure of the Venus Flower Basket, a deep-sea sponge which grows in the ocean and distributes its material, natural glass fiber, based on growth towards light and ocean currents. Material is only used where necessary and I was inspired by this growth patterns and generated the garments with a similar design strategy. Thus, it is not only the aesthetic but also the material performance which influences the bio mimicry in my designs. A: The garments have a muted colour scheme, placing emphasis on the process of creation and pattern built into the clothing. Why did you choose this tonal range and do you have any plans to experiment with colour in the future? JK: Designing with the raw colours of these both natural fabrics and highly synthetic materials elevates the focus on 3D surface articulation and patterns. The white, black, grey, brown colours align with the un-processed 3D print color palette and delicate leather and create a beautiful visual relationship with the various skin tones. All photographs are taken by Pia Clodi with her analogue camera, which again produces these otherworldly enigmatic beautiful effects. A: You recently created some accessories for the film Black Panther. Has the use of 3D printing in popular visual culture increased awareness or demand of this new form of clothing? JK: It was an absolutely fantastic experience to work on the designs for the 3D printed costumes for the movie. The garments were inspired by traditional African lace patterns and the collaboration with Costume Designer Ruth Carter and the team at Marvel was inspirational. It definitely raised awareness about the possibilities of what can be done with the technology and how it can find real-life application in the fashion industry. It set an example of how it can transform traditional fabrication techniques and how the technology enables me to realise designs which look like they cannot be hand done. I am intrigued by the highly synthetic processes and the very organic aesthetic you can achieve with this manufacturing technology and recently completed an academic research paper on this topic. A: What is the future for your practice? JK: Black Panther not only raised awareness about the technology it also raised awareness about my company and label JK Design and the Iceland Collection. While I will continue to realise new projects with Hollywood entertainment production companies as well as French Haute Couture Houses, my personal focus is on continuously researching emerging technologies in additive manufacturing, from “rapid prototyping to manufacturing.” I will develop the label and innovate on the implementation of the technology in clothing further transforming the fashion industry. The future in fashion shows great need for local production, eliminating sweat-shops and shipping and the additive manufacturing technology has a promising solution to these issues. Mass customisation will allow for individual design as well as for a sustainable local fabrication. 1. Design: Julia Körner | JK @koernerjulia. Photography: Pia Clodi @piaclodi. Model: Sigrún Hrefna Sveinsdóttir @sigrunhrefna. Model Agency: Eskimo Agency @eskimo_model. Make Up & Hair: Sunna Björk @sunnabjorkmakeup. 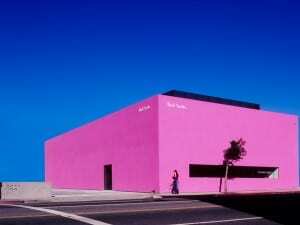 Photography Scanning & Processing: Carmencita Lab @carmencitalab. Leather Artisan: Oficio Studio @oficiostudio & Kyle Awtry @Kyle Awtry.